Sometimes, things just don’t work out the way you planned. For example, at the beginning of this school year, I promised myself that I would actively keep up with all the readings in all my courses. 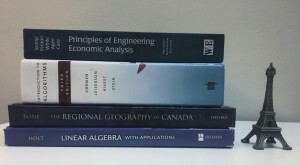 With midterm season come and gone, I realized that I fell behind in 3 of my courses while studying for midterms. I’m currently trying my best to mitigate the setback by doing my readings for at least 3 hours a day until I’m caught up with all my courses. Nevertheless, this setback was not planned! Academic setbacks are a common side-effect of being a student. Some common setbacks include: failing to meet your personal academic goals, struggling to keep up with your courses, failing a course, academic probation, or academic suspension. Setbacks can be caused by a variety of reasons: schedule overload (with school, work, and extracurricular activities), inefficient time-management, inefficient studying habits, poor physical/mental health, as well as other personal factors (such as your study environment, ongoing events in your daily personal life, personal strengths/weaknesses, etc). It’s very rare for someone to go through their undergraduate studies without a single setback, so it is nothing to be ashamed of. If you find yourself amidst an academic setback, avoid being harsh on yourself. Self-compassion is key; setbacks happen to everyone and it’s not the end of the world. Once you accept that you endured a setback, you can begin putting in place the strategies to help you bounce back. The first step to bounce back from an academic setback is to identify what caused the setback. The second step is to devise a plan to not only help you get back on track, but to also help you stay on track. What does this plan entail? Find out what steps you can take to undo some of the damage the setback has caused. This prevents your progress from being hindered further, and directs you towards success. For example, if you failed a midterm worth 20% for a course, but there is an essay worth 15% due for the same course next week, damage control involves trying your best on the essay to salvage your course grade. Damage control helps you “undo” the setback to some extent. However, in order to truly bounce back from a setback, you must ensure that it doesn’t happen again. In step 1, we identified what caused the setback. Now it is time to put in place a plan to ensure that another setback does not occur for the same reasons by changing your habits. For example, if the reason for the setback was that you did not study sufficiently for your test, your new plan would have to incorporate good time-management and study habits to help you reach your goals. The third step is to reflect on your experiences, and the strategies you used to mitigate the setback to learn lessons for future instances. If you ever find yourself amidst an academic setback, and you feel emotionally or academically overwhelmed, it is essential that you seek help immediately to prevent further hindrance of progress. The university offers a variety of services to help you bounce back. Throughout the year, you can meet with a learning strategist. A learning strategist is a trained professional who provides individualized academic support; they help you understand your learning style and guide you towards the appropriate strategies to maximize your learning efficiency. To meet with a learning strategist, you can drop-in at the ASC or book an appointment. In one of my previous blog-posts, I give an account of my first-time experience with meeting a learning strategist, which I found to be very helpful! The Academic Success Center also offers a variety of workshops to help you develop efficient learning style, manage stress, and develop an academic plan to help you succeed. Visit the ASC website for more information on their upcoming workshops. 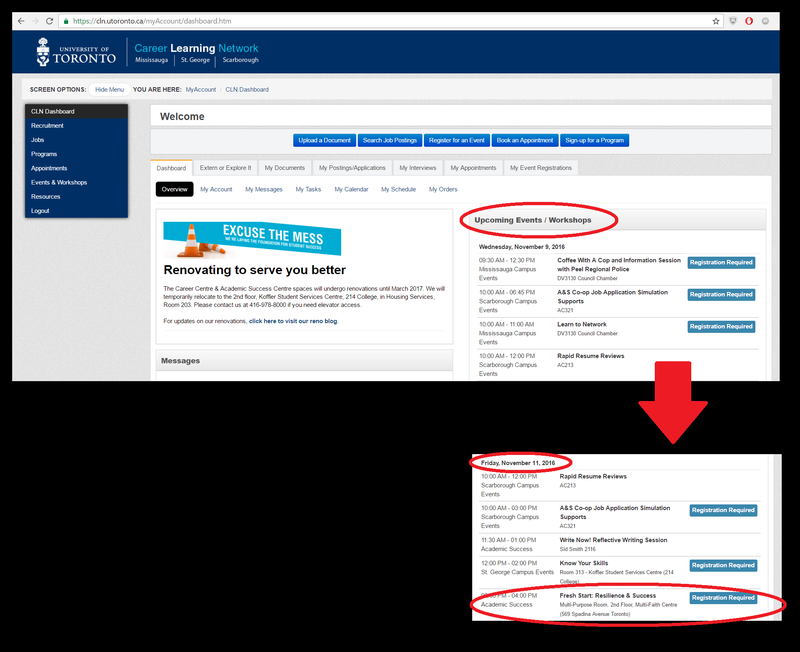 Furthermore, there are a variety of other workshops offered by UofT which you can browse through on the Career Learning Network (CLN) website. Simply log in with your UTORid, and you can browse and register for workshops which may be helpful to you.